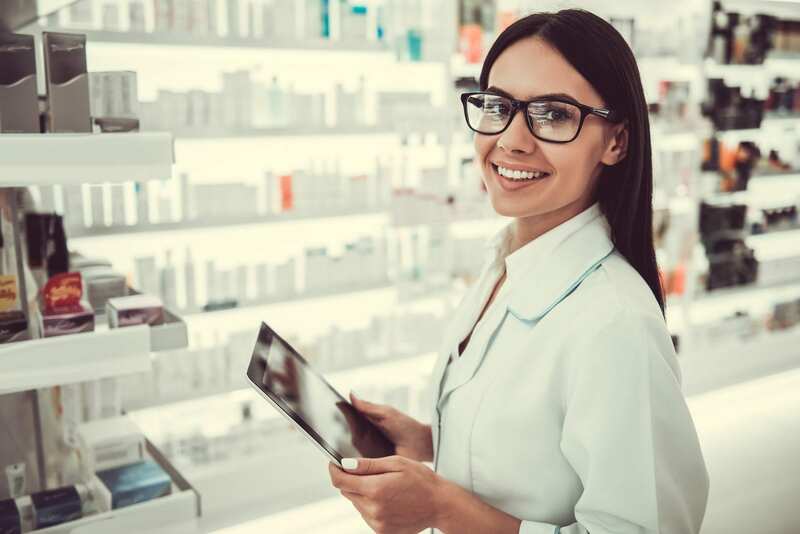 As trained health care professionals, pharmacy technicians work in hospital pharmacies, retail pharmacies, and clinics under the supervision of a registered pharmacist. They prepare and fill prescriptions, issue medications and health care products, label, package and store supplies, process insurance claims, manage billing, and assist customers. They play a key role in the pharmacy and give pharmacists the freedom to counsel patients and stay on top of new technology. Pharmacy technicians in Georgia must register with the Georgia Board of Pharmacy by submitting and application online and mailing the supplement packet. All applicants must be at least 17 years old, be enrolled in high school or have a high school diploma, obtain a criminal history background check, and submit the license number of the pharmacy if employed. Certification is not mandatory. However, the Board recognizes certification obtained through the Pharmacy Technician Certification Board. Certified technicians should submit a copy of their certificate to the Board. Employers typically favor certified pharmacy technicians, so taking the national PTCB exam will increase your employment opportunities. Lanier Technical College’s Pharmacy Assistant Technical Certificate program offers students a fast-track training to assume entry-level employment in hospitals, nursing homes, clinics, and retail pharmacies. The curriculum blends didactic instruction with laboratory training in the fundamentals of receiving, storing and dispensing medication and anatomy and physiology. The certificate program requires completion of 35 credit hours in medical terminology, fundamentals of mathematics, pharmaceutical calculations, principles of dispensing meds, pharmacology, and pharmacy assistant practicum. The diploma program requires completion of 56 credit hours. Course topics include medical terminology, human body structure and function, pharmacy tech principles, pharmacology, sterile meds prep, dispensing medications, pharmaceutical calculations, introduction to computers, and introduction to healthcare. The program accepts new students in the Fall and Spring semesters. Applicants must be 18 years or older, have a minimum grade of B in Math, and complete prerequisite courses with a cumulative GPA of 2.0. A criminal background check, TB skin testing, and drug screen will be conducted on all students for participation in the pharmacy externship. Students convicted of a felony or misdemeanor may not be able to complete the program due to denial of state registration. To graduate from the program, students must complete an exit exam and receive a passing grade of 80% or more. NGTC equips pharmacy technician students with the knowledge and skills to start a rewarding career in the field of pharmacy. The program leads to a diploma or an associate degree in pharmacy technology. The curriculum emphasizes hands-on training in pharmaceutical calculations, sterile preparation, pharmacology, dispensing medication, and much more. Practical experiences are combined with academics in the classroom and basic pharmacy operations in a simulation lab. Basic operations include maintaining patient records, procuring, storing, and issuing medications, pouring, measuring and weighing dosages, and heating, grinding, dissolving, and mixing drugs. The path that leads to the associate degree requires completion of 65 core, science, and general education courses in 5 terms. Occupational courses include medical terminology, anatomy and physiology, introduction to healthcare, pharmaceutical calculations, pharmacy technology fundamentals, principles of sterile medication preparation, and advanced pharmacy technology principles. The path to the Diploma in Pharmacy Technology requires completion of 56 credits in 4 terms. Course topics include structure and function of the human body, pharmacy technology fundamentals, introduction to health care, medical terminology for allied health sciences, and principles of dispensing medications. Applicants must be 16 years or older, have a high school diploma or GED, and complete the placement test or provide SAT or ACT scores. Once enrolled, students must meet the technical competencies, including a physical exam and immunization record, carry personal liability insurance, have a negative criminal background check and drug test, register with the Georgia Board of Pharmacy prior to the clinical rotation, and maintain a GPA of 2.0 or better. Tuition costs $89 per credit hour for Georgia residents. Registration costs $50. New Horizon Medical Institute trains pharmacy technician students for employment in a community pharmacy, hospital pharmacy or retail chain. Students learn the how to read, fill, and distribute prescriptions, package and label medications, perform basic pharmacy calculations, handle various categories of drugs, practice within the legal guidelines of pharmacy, and understand common drug interactions and side effects. The curriculum covers a total of 440 hours including 130 hours of clinical externship. Course topics include medical terminology, medical anatomy and physiology, introduction to pharmacy, pharmaceutical math and drug dosage and calculations, pharmacy ethics and procedures, pharmacy drug therapy and treatment, intravenous admixture and sterile compounding. The estimated time to completion is 16 weeks. Prospective students must take the TABE test and obtain a score of 10.0 or higher. Applicants must be 16 years or older, provide a copy of state photo ID and social security card, have a high school diploma or GED, pay the non-refundable registration fee of $75, and submit WIOA voucher on or before the first day of class – WIOA students. Once enrolled, students must demonstrate competency in the pharmacy tech skills and complete the pharmacy externship requirements. Graduates are eligible to take the PTCB or ExCPT National Exams to become a Certified Pharmacy Technician. The total cost of attendance is $4,605 and includes tuition, registration, books, CPR/First Aid, state registration, online tutorial, and certification exam.